Description: 1954 $1 bills were issued as “devils face” and as “modified portrait” notes. We show examples of both types in our picture guide below. 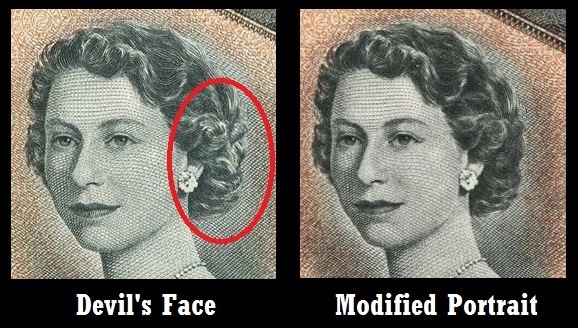 If you look at Queen Elizabeth’s hair then you can see a shape that looks like a hook nose, bushy eye brows, and snarled lips. That is the identifier for the devils face note. Our guide here specifically applies to devils face notes. The modified portrait variety is many times more common than the devils face variety. 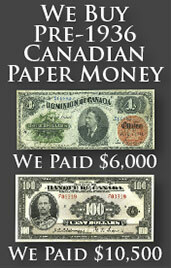 All Canadian bank notes from 1954 have a similar face design. Only the colors and back designs differ between denominations. One dollar bills are green in color and show a prairie and sky scene on the back of each bank note. Varieties: 1954 one dollar Devils Face notes can be signed by J.E. Coyne and G.F. Towers or by J.R. Beattie and J.E. Coyne. There are other varieties based on whether or not the serial number starts with an asterisk. Asterisk notes are very rare. 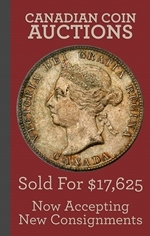 There are lots of other more common varieties on the modified portrait notes that we are not covering here.